Will The Real Slim Shady Please Marry Me? That boy is fierce. Mad. HAWT. Sort of like my George. See the resemblance? I KNOW! Uncanny. There are very minor differences between my two men. Both have mad rhythm. Both were raised in the skreets. And both rock a pretty strong pimp hand. Really. I’ve been a die hard since I don’t know when. Only concert I ever contemplated throwing a bra on stage. Okay, I’m lying. Who does that? I did (once or twice) pretend to be the girl in the “Superman” video. And, don’t even GET me started on Rihanna. I have one other teensy confession. I went to see “8 Mile” TWICE the day it came out in theaters. That was a good day. I laughed. I cried. I bought the t-shirt. When Rayden was visiting, we spent 3 hours in the car flipping through all the albums on my iPod. Ahhh, lots of memories made to my gravel-voiced dream man. I taught Rayden to rap to Eminem when he was 8 years old-ish. He would be “flowing” along at top speeds, mimicking the master, (gangsta side slice hand dance too) but would never say the cuss words. Such a good little brother. Now, he says the cuss words like he wrote them himself. Such a funny little brother. So, while I’m not a big partier, I don’t stay up late, I “just say no”, and I find comfort in George’s mental stability, I still find myself dreaming of the day when Em tosses me his sweaty beanie off stage at one of his shows. Nobody wears a beanie better than him. He will forever be my “get out of jail free” celebrity, and George understands that. Didn’t you hear that in my wedding vows? I said it, I swear. You know, for some reason, I can totally "see" you doing your Oprah voice. Very Cool. I just found your blog and we have a lot in common. I LOVE Marshall AND Dachshunds…and I LOLed when you referred to them as Wiens. I do too! 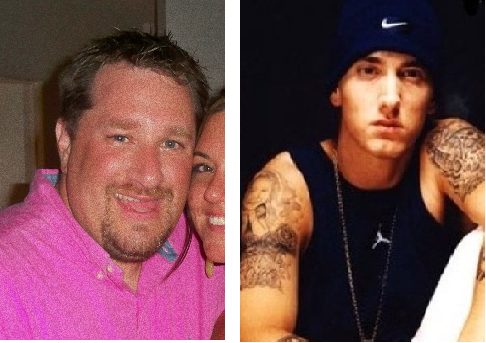 You and Eminem . . . soul mates.Obviously.Love this! Next post: The Perfect Spot! Copyright © 2010 - 2010 Jen Has A Pen. All rights reserved.